The first ever "Hindi Radio" for Frankfurt! 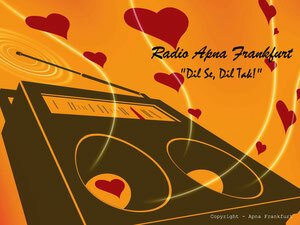 You can listen to Radio Apna Frankfurt anywhere, where Internet is available. Listen to the Radio while at home, in office, in the car (opening link on mobile devices and connecting them to car audio system) or even when you are on the way in public transportation using mobile devices. Question: How much Data is used by listening to Online Radio through Apps? Answer: Listening to online radio at 64kbps consumes around 0.48 MB data per minute and around 30 MB data per hour. Question: How much is 30 MB data? Answer: As a comparison, to watch a 2.5 minute video in 720p quality on youtube, it required approximately 30 MB data. Radio - Apna Frankfurt is the first Radio in Frankfurt region dedicated to the South East Asian Community living here. The purpose of this Radio is not only to provide entertainment in the form of Indian music but also to establish a collaborative platform to share information among the listeners of this radio. In case you are interested in giving advertisements on this radio for your events and businesses, or you want to share your opinion on this radio, please contact us! The link opens another window. Press PLAY button and enjoy the radio. In an exceptional case, if the Radio is offline, please contact us! We will bring the Radio online as soon as possible! And, if you like it, don't forget to Hit Like Button on the Radio screen! Thanks! Your feedback and suggestions are very important for us! Please provide your feedback/suggestions using the section below. Excited .. this is a great initiative.. Very good idea. The song collection and quality is quite good. great song collection..its a pleasure to listen this radio...the informatiin provided is also useful for community living here!! Great to hear to the "APNA FRANKFURT" radio. this will bring all the Indian communities together and will also be a good platform for community engagement. This radio station fulfilled wishes of all Indians who have been living here since ages and wished an official bollywood radio in Germany. Great news. Looking forward to getting entertained with Indian music. Song collections are very nice and info given in between are quite good too. Feel like home in India!! All the very best to team Apna Frankurt. Very good initiative, nice collection of songs and excellent streaming. Go all the way, wish you the team all the best. Good initiative. All the best to Sapna Radio. On behalf of HCA sand Bharat Verein. At last, feel like India comes to Germany. kudos ! great initiative, much appreciated. Happy to hear Indian songs with superb voice quality. will spread the link to others. After a long time, felt like I m back home...loved it! Cheers to this initiative!! Great initiative .... Feel like home county ...all the good luck . Its an excellent approach.......Dil se dil tak....All thanks to Apna Frankfurt motives. Very good initiative. Superb streaming ....Feels nice. Kudos to the everyone involved ! Wishing the team loads of success ! Excellent initiative and awesome implementation of it. Songs selection, streaming, quality is super. Thanks for Introducing Apna Frankfurt!!! Very nice Initiative. Feels like in home with all nice songs.Making my S bahn journey joyful!!! Nice initiative, apart from online radio, there's a huge other information in and around Frankfurt. Thanks guys. Waiting for info on Kannada songs and Program info as well. Liked all the infomrations especially "IMPORTANT CALL NUMBERS". Thanks again. Keep up the good work. Gr8 effort. Superb initiative. This was really missing in Frankfurt..
One suggestion : Can you please also share upcoming movies updates and reviews? Also where can we see in Frankfurt? Is there any specific show already on this Radio? Thanks to Indian fest, I came to know about Alphafrankfurt. Great site with useful Infos for Indians and also about Germany and Frankfurt. Haven't listened to their radio service yet but I will do it now. Thanks ! Great, was really waiting for the Indian radio. and here it is. Keep going guys. You are doing awesome. Good effert. Thanks for it. apna frankfurt abroad. Thanks for up keeping candid nativity with same melody. I felt at home forgetting tedious journey in odd hours too listening to bollywood ambience. Thanks to novel concept. Weekend Time Family time ...making weekend musical with friends too. Just downloaded the play store app. Wonderful initiative. Will share with all our Desi friends. In London we had Sunrise Radio... Germany finally got it's Apnafrankfurt! eine sehr gute Liederkollektionen und erstaunliche Klangqualität ..
Wow...this is awesome! !.Though I don't stay in Frankfurt it's great to connect and enjoy apna radio in Deutschland..Keep entertaining!!! nice feeling in Germany Bollywood channel great means Indians in Germany can get details of India and Bollywood,keep it up. Great initiative. By any chance are you thinking to put it in FM frequency ? Was introduced to this radio channel last week, have been listening it since then. Must say it's difficult to switch it off, no matter what time of the day I switch it on. Nice and balanced content.